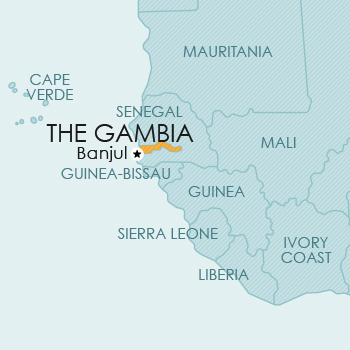 The Gambia is an independent republic within the British Commonwealth, on the west coast of Africa. Except for its western sea coast on the Atlantic, it is completely surrounded by Senegal. The Gambia is a member of the Paris Convention and the WTO/TRIPS. Provision is made for the registration of marks for goods (trade marks) and for services (service marks), as well as for collective marks. The Act also provides for the protection of trade names. The Gambia is a member of the Paris Convention, the PCT, ARIPO (Harare Protocol) and the WTO/TRIPS. Although it is possible to file PCT national phase applications in The Gambia, the law has not been amended to provide for the PCT. Accordingly, it is not clear whether enforceable rights will be obtained via PCT national phase filings in The Gambia. However, it might be arguable that protection obtained via PCT national filing in The Gambia is valid, since the Act states that the provisions of any international treaties in respect of industrial property to which The Gambia is a party shall apply, and, in case of conflict with any provisions of the Act, shall prevail over the latter. The Gambia is a member of the Paris Convention, ARIPO (Harare Protocol) and the WTO/TRIPS. Design protection is available by way of a national filing or via an ARIPO application designating The Gambia. The Gambia has implemented the Harare Protocol (which regulates patent and design filings in ARIPO) in its national law, thereby giving valid design protection to applicants seeking to obtain a design registration via ARIPO. The Gambia is a member of the Berne Convention and the WTO/TRIPS. photographs, works of applied art and handicraft. collections of works, collections of folklore. Currently, no legislative provision for plant breeders’ rights or other sui generis protection for plants is available in The Gambia.